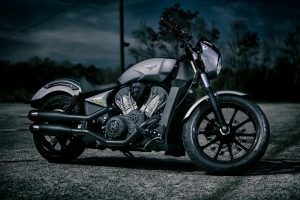 Victory has just released a new muscle bike called Octane. The bike is retailing in the UK, starting at £9799. It is available in one color only right now, Super Steel Gray. The chassis and the powertrain are completely blacked out, giving the motorbike a modern, monochrome look. Victory defines the bike as 'a combination of a heavy duty motor and a light chassis, minus unnecessary accessories'. The bike stocks a 1200cc engine, one of the most powerful in its class. Still, when you look at the bike, you cannot imagine this beast has this much power because it looks so small and petite. Is the Octane a 'revamped' Indian Scout? The Octane shares a number of features with the Indian Scout (Polaris, the parent company of Victory, also owns Indian Motorcycles). Brandon Kramer, Product Manager at Victory says the Octane copies many designs and parts from the Indian Scout (about 35% of the parts are similar). The Octane also borrows many frame structure elements from the Scout like the aluminum castings in the front and rear bolted to the engine, and the aluminum rails that embrace under the tank. It seems Victory wanted to keep the bike in an affordable range, even as it has tried to give the Octane a personality on its own. Because of this some observers calls the Octane a 're-bandaged Indian Scout', though, we hardly think so. The company has gone to great lengths to distinguish the Octane from the Indian Scout, so as not to give the customers any reason to compare the two bikes. The changes include restyled head and barrels, new side panels and nose cowling, new fenders on front and rear to match the large tires, and repositioned shock absorbers (rear). The bike comes with ABS. The Octane's V-twin engine is based on the Victory's famed Project 156 racer, which competed at the Pikes Peak International Hill Climb, also known as 'Race to the Clouds'. The engine can race a quarter mile in under 12 seconds and do 0-60 mph in 4 seconds. Accessories are sparse and optional accessories are few by far, ensuring the bike remains lightweight. What the bike lacks in accessories, it makes up in looks. The cast aluminum chassis is especially eye catching. You can say, it is the highlight of the bike. The handlebar is leveraged in such a way as to give you the widest steering geometry. The Octane allows you to lean in more than most cruisers. You can bank as much as 32-degrees before you touch the ground on your right. The bike handles beautifully and there are no surprises in performance. Note that this is not a long distance cruiser. If you want to take long rides, there are other Victory motorbike models for that. We think the Octane has a good built quality though it may be too early to say that, seeing how the bike is a recent launch and we do not have long time data. Do not forget, Victory is offering a 5-year warranty on this bike, the best in class. If you are thinking about buying this bike, we recommend that you do it with eyes closed.